This beautiful 1 bedroom ground floor condo sits just steps away from the ocean. With views of the Pacific Ocean and in season WHALES!! With all your needs for a home away from home. The kitchen is fully equipped with ll your cookware & dining ware. There is a fullsize washer and dryer in the condo for your convenience. 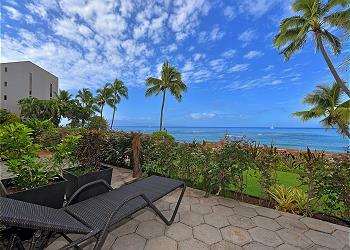 Step out from the lanai directly on to our ocean front property with views of Molokai & Lanai.